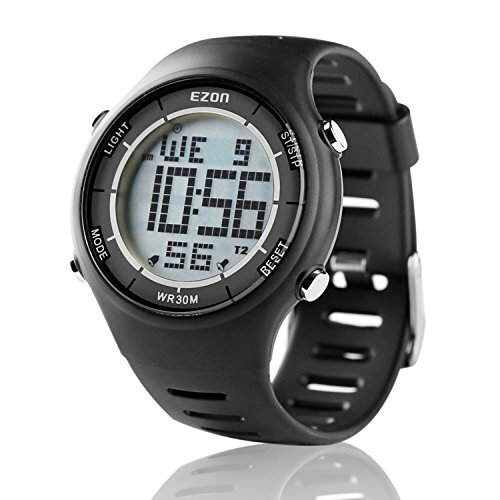 This is the multi-functional digital running sport watch which has the following functions: 10 lap stopwatch, countdown timer, 50 years calendar, 2 sets of alarm, hourly chime and 30 meter water resistance. Stopwatch Function ----- The stopwatch is precise to 0.01 second. The maximum time of the stopwatch is 99 hours, 59 minutes, 59 seconds. Lap stopwatch is used to record the lap time and split time. It can record 10 lap time. Countdown Timer ----- The watch can count down from a preset time to zero, when zero is reached it will chime. 30 Meter Water Resistance ----- The watch is water resistant to 3 ATM. It is no problems to wear our watch while daily grooming and raining, except swimming,diving and having sauna. EL back light designed ---- more easy to check the time at the night or where the light is not strong.